Following the footsteps of Google and anticipating the need of an optimum mobile web experience, Google’s biggest rival, and the successor to MSN search, Bing will introduce its own version of “Mobile Friendly ranking Algorithm” Similar to Google, Bing will provide tools to help websites to test themselves for mobile. While Google was profound with the date, 21st April, as the rollout of its version of “Mobile Friendly Algorithm,” Bing yet to come out with a date. Being second favourite after Google, Bing is apprehensive about a fixed date, single day rollout and rather insisting on a slower, phase-by-phase rollout. Meanwhile, it wants feedback from major webmasters. Newer features might be test run among them before a wider rollout. Not a creative way though quite visible most of the times. With two of the best search engines joining the mobile brigade, the vows in the line of “my website is not working properly on my iPhone” will be gone if the tag is not a clear indication. The idea of promoting mobile compatible websites higher in the search results will push search marketers to adopt the idea. It’s a win-win situation for both: mobile users and webmasters. Bing search will still insist on relevancy. A non-mobile friendly website with better relevancy to the search term will still rank higher than a mobile friendly, less relevant website. However, “mobile-friendly” tag will be an important signal for websites equal in relevancy as per Bing. Striking the right balance between user friendliness and relevancy is important. How to test your website? 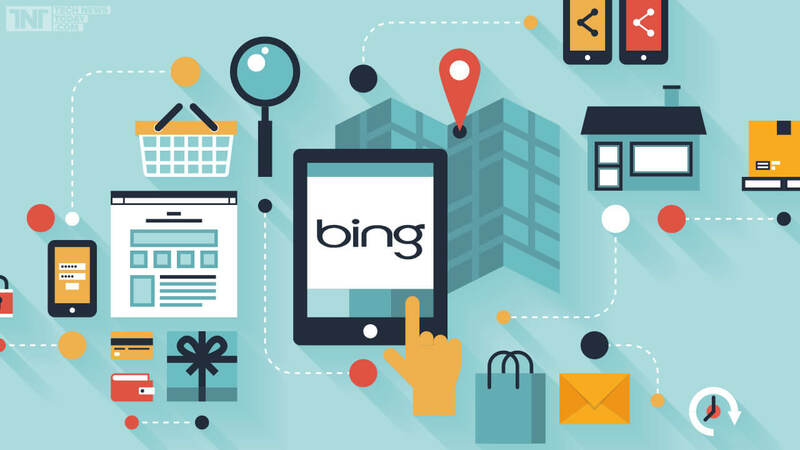 Following the pursuit, Bing will also launch a tool to help webmaster analyse webpages. The tool on entering a webpage’s address will scan the page and declare whether it’s mobile-friendly or not. If not, a proper route and guidelines to make it mobile-friendly will be provided in the results. In addition to being clickable, the buttons should be well-spaced and described to offer a comfortable operation with one’s fists without triggering wrong clicks. A desktop-only website when loaded on a mobile requires frequent pinches, zooms and extended scrolling to navigate. The pinch and zoom desktop sites on mobile devices are not mobile friendly. Scrolling lengthwise is acceptable to an extent for really large piece of content, however, not left or right scroll. A mobile unfriendly website when loaded on a mobile often requires frequent right, left and up and down scrolls for grabbing desired piece of content. Flash, for example, is non-compliant mobile content that is not supported by devices post Android ICS and none of the iPhones and iPads. It should be avoided at all cost to be delivered on a mobile device. 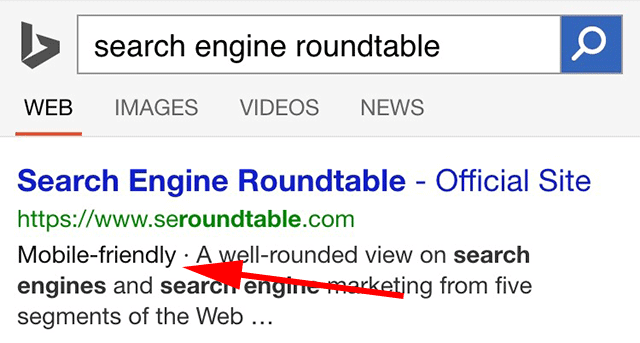 Website content incompatible with the target device will not gain mobile-friendly tag from Bing. To receive feedback from webmasters, Bing has a separate site called Binglistens powered by uservoice. The site collects ideas to make Bing better. All the collected ideas are then put on the website, allowing user to vote for them. 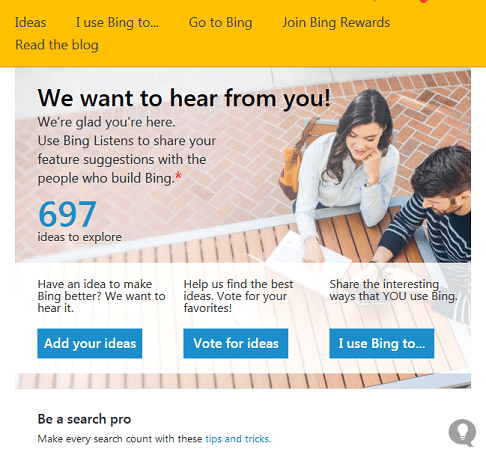 The ideas gaining maximum votes are added as a feature on Bing. The community is pretty active; currently 697 ideas are up for exploring. Nevertheless, only the ideas attaining maximum votes makes it to Bing. When it comes to web searches, Google is the king without a doubt. But everybody need an alternative (don’t we?) and currently Bing is the only hindrance between Google and search monopoly. Watching it going shoulder-to-shoulder with Google in every development is a nice thing to see with “mobile friendly ranking algorithm” coming as a big step. No matter what, together these two—biggest search engines on the planet—are making mobile web much more friendlier to the users. Not to mention, their rivalry and increasing competition, every day, making the web a better place. Without either of them in the race, the web search won’t be this useful as it’s today. The innovations in the form of the algorithm updates, keeping spammers at bay, and, with the mobile specific update, putting all the information at the tap of our screens: the brightness these search engines have brought to our life is far beyond anything we have ever imagined. There are reasons we’re brighter than our grandparents and parents. After all, The knowledge is in our hands now. Next post: What is GPT Money Making Sites? How To Make Money With That!